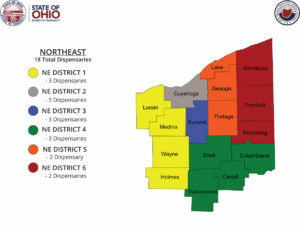 As of 9/7/2017, dispensary applications for the state of OH have not yet been released . We expect applications to be released within days of cultivation licensees being announced. Rumor has it that will be in mid-November. The time to secure your real estate and to jump-start your application is now. With a total of 60 potential dispensaries up for grabs scattered across the state, competition is sure to be fierce. 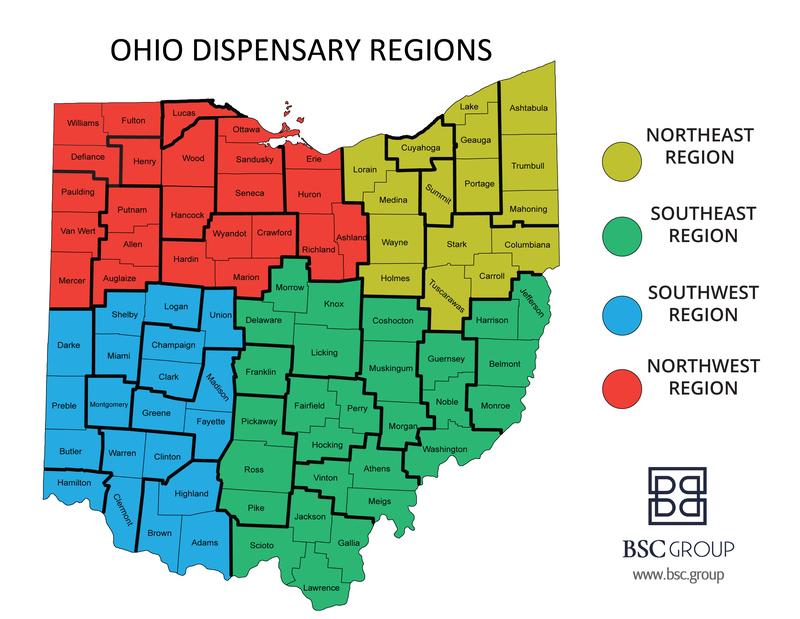 Like cultivation applications in Ohio, once the applications are released, you will have a maximum of 55 days to complete and to submit the application in person in Columbus. Below is a complete summary of all final rules confirmed by the Ohio Board of Pharmacy on 8/14/17. Must have an area designated as quarantine. Expired, damaged, deteriorated, misbranded, or adulterated medical marijuana shall not be stored at the licensed dispensary for more than one week. Waste must be quarantined and reported to the state before destruction. The 51% Colorado Rule applies to all waste. Security cameras at the point of sale must capture, the face of the cashier, the face of the patient and the computer screen. Cameras must be streaming 24/7 and recording the entire time the dispensary is open AND records must be kept for 6 months. A silent duress alarm, panic alarm, holdup alarm, and automatic voice dialer are required. Permit must be renewed every 2 years. Permit is $70,000 biannually. All owners, officers, advisors, and employees will be fingerprinted and pass a criminal records check. Anything more than a traffic ticket conviction may present a challenge. Felony convictions automatically disqualify. Dispensary can be open from 7am-9pm ET maximally. Dispensary must be open at least 35 hours per week. While dispensary is open, it must have at least 2 employees present, one of those a “key” employee. Patients can buy up to 90 days supply at one time. Retain inventory control records for 3 years. No products requiring refrigeration or warming can be possessed or sold by a dispensary. There’s a 70% THC limit on infused products. Every sale is recorded in the inventory control system that must also communicate with the State of Ohio’s prescription monitoring software. All sales must be reported within 5 minutes (basically in real-time) and a report must be generated to the state every day regardless of 0 sales on a day when the dispensary is closed. Every employee must be licensed with the state, which costs $100-$500 depending on their role and access. Requires every employee complete 16 hours of continuing education every 2 years in addition to initial training. No more than 60 dispensaries will be permitted before 9/8/2018. After that date, the Board of Pharmacy “has the option” to determine if additional licenses should be issued. Provisional licensees will have 180 days to become operational. Though the license applies only to the location specified in the application, you may apply to move locations within the same district for a $5,000 fee. Change of Ownership (a controlling interest) is allowed but must be documented and requires an additional application to be submitted within 30 days. All advertisements must be submitted for approval ($100 each) which can take up to 15 days. Strict restrictions on billboards, radio, tv, flyers, handbills, handheld signs and more. Social media and internet advertising targeting 18+ seems to be okay. One person must be titled “dispensary designated representative” and serve the role of General Manager, signing off on and approving all major activities. They must be on-site 20+ hours per week. This person will become the face of this dispensary. Interested in applying for an Ohio medical marijuana dispensary? Contact us today.